5th Group Stage match of CLT20 2014 was played between Kings XI Punjab vs Barbados Tridents (KXIP vs HH) at Punjab Cricket Association Stadium, Mohali, Chandigarh. RA Reifer 60 and EMDY Munaweera 50 runs washed away as DA Miller 46 and Akshar Patel's quick inning of 23 runs of 9 balls gave Punjab win by 6 wickets with 2 balls remaining. DA Miller declared man of the match for his unbeaten 46 runs of 34 balls. Earlier Punjab won the toss and chose to field first and let Barbados to set target. Barbados started inning confidently and both openers played well. WKD Perkins lost his wicket early scoring 10 runs and RA Reifer joined with EMDY Munaweera. Both took the charge and played superb inning for Barbados. EMDY Munaweera made quick 50 runs of just 26 balls before departed. RA Reifer played till end and contributed well for Brisbane, he made unbeaten 60 runs of 42 balls and managed to put 174 runs on board at the end of 20 overs. Following target of 175 runs, Punjab got stady start with M Vohra and V Shewag. Today Sehwag was calm and Vohra go after bowlers. He lost his wickt in hurry scoring 27 runs. Saha and Maxwell also through away their wickets in much hurry. DA Miller played good inning of 46 runs and Akshar Patel quick inning of 23 runs of 9 balls gave superb win to Punjab over Barbados by 5 wickets. DA Miller declared man of the match for his unbeaten 46 runs of 34 balls. 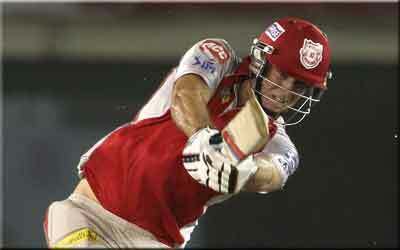 Points - Kings XI Punjab 4, Barbados Tridents 0.